June 7, 2012 - Mechanical defects that prevented the automatic deployment of speedbrakes, which assist in slowing the plane after landing, and the captain's failure to monitor and manually deploy them led to an overrun of a passenger jetliner off of a snowy runway in Wyoming. The incident was compounded by an anomaly with the thrust reversers. 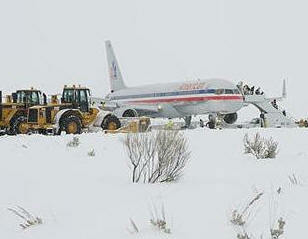 On December 29, 2010, at about 11:38 a.m. MST, American Airlines flight 2253, a Boeing 757-200, ran off the departure end of runway 19 during light snow after landing at Wyoming's Jackson Hole Airport (JAC). The airplane came to rest about 730 feet past the departure end of the runway in deep snow. None of the 179 passengers and six crewmembers were injured; the airplane sustained minor damage. The flight originated from Chicago O'Hare Airport. "Through this investigation, all of us the investigator, manufacturer, operator, and pilots, alike all learned important safety lessons," Hersman said. "The recommendations we issue today will make valuable contributions to improving aviation safety." The investigation found that the pilots, both of whom had flown into JAC on numerous occasions, were familiar with the challenging wintertime landing conditions there and had made thorough preparations for the approach and landing during what they described as an otherwise uneventful flight from Chicago. The approach to the runway was normal and the airplane touched down about 600 feet beyond the approach threshold. The speedbrakes, which disrupt the airflow over the wings and greatly increase the wheel braking effectiveness, did not automatically deploy as designed. The CVR transcript showed that the captain, acting as the monitoring pilot, failed to identify the non-deployment and erroneously stated "deployed" shortly after touchdown. Immediately after this, the first officer, who was the pilot flying, tried to deploy the thrust reversers; when they did not initially deploy, the captain took over the thrust reverser controls and they deployed about 18 seconds after touchdown. Subsequently, the airplane continued off the departure end of the runway, coming to a stop in deep snow off the end of the paved surface. American Airlines training and procedures require the pilot monitoring (in this case, the captain) to observe and call out the position of the speedbrake lever after landing; if the speedbrakes do not deploy automatically, the captain is to manually deploy them. Although the pilots could have manually deployed the speedbrakes at any time during the landing roll, neither pilot recognized that the speedbrakes had not automatically deployed because they were both trying to resolve the thrust reverser issue. The landing performance analysis showed that under similar runway conditions, even without thrust reverser deployment, the airplane would have stopped about 4500 feet down the 6300-foot runway had the speedbrakes been promptly deployed. The investigation revealed that the speedbrakes did not automatically deploy because of a latent assembly defect in one of the speedbrakes mechanisms. In addition, the NTSB determined that the thrust reversers did not initially deploy because of a rare mechanical/hydraulic interaction that occurred in the thrust reverser system as a result of an unloading event at the precise instant that the first officer commanded their deployment immediately after touchdown. As a result of the investigation, the NTSB made the following new safety recommendations to the Federal Aviation Administration (FAA): require that all transport category air carriers develop and incorporate training to address recognition of a situation in which the speedbrakes do not deploy as expected after landing; require all newly type-certificated air transport category airplanes to have an aural, or otherwise unique, alert that warns pilots that the speedbrakes have not deployed during the landing roll; and require Boeing to establish guidance for pilots of all relevant airplanes to follow when an unintended thrust reverser lockout occurs and to provide that guidance to all operators of those airplanes. The NTSB also reiterated to the FAA three safety recommendations related to multiple emergency situation flight training and monitoring skills and workload management that it had made during investigations of previous accidents.